The Australian Open is consistently among the most watched programs of the year. Last year’s men’s final was the second most watched program of 2017, with a national average audience of 3.64 million. This year’s men’s final secured a national average audience of 2.37 million - the top sports program and the third most watched program on Australian television this year. Nine’s director of sport Tom Malone added: “We are delighted that Wide World of Sports will become the new home of tennis in Australia. The Australian Open is an incredible tournament and event which will complement our existing rights across NRL, State of Origin, Netball and The Masters, as well as providing benefits to our news, entertainment and lifestyle pillars. Seven has been the host broadcaster of the Australian tennis season for decades. The tournament provides the network with a lot of momentum at the start of the year and is a valuable platform to promote tent pole shows. 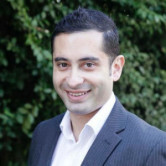 “Seven was the first to deliver the game on multi-channels, the first to live stream and the first to deliver every single match across the screens of Seven to every Australian, along with consistently innovating the broadcast on the way," a Seven spokesperson said. Roger Federer lines up a backhand winner in the Australian Open. Photo: A. Hickman. Nine has secured the exclusive rights to all premium tennis played in Australia from 2020 to 2024. Nine acquired all audiovisual rights for broadcast, streaming, mobile, digital and social platforms under the deal with Tennis Australia. Nine will work with Tennis Australia and other industry stakeholders to find other distribution channels that will complement Nine’s broadcast of tennis. 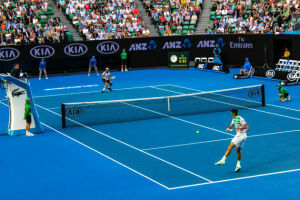 “We are thrilled to have secured the rights to premium Australian tennis, particularly the Australian Open. The timing of tennis and the audience demographics it delivers are a perfect fit for Nine and its advertisers," Nine CEO Hugh Marks said.